Gwyneth Paltrow was Hollywood’s “Most Hated Celebrity” just last week, a title that is being revisited because she is now being called the “World’s Most Beautiful Woman” by People Magazine. I don’t understand all the Gwyneth bashing. She seems to be disliked for talking about herself, as if it’s her fault that she’s only ever asked questions about her movies, healthy lifestyle and biblical fruit children. Perhaps we could channel certain energies away from Kristen Stewart, Tom Cruise, Anne Hathaway and Gwyneth Paltrow, who aren’t actually bad people, and focus on members of Westboro Baptist, or anyone who made “Free Jahar” trend on Twitter. Is Gwyneth really so unlikable? As far as looks go, she has a nice smile and shiny gold hair. 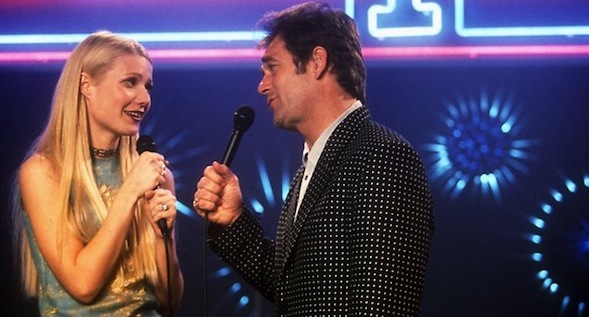 Perhaps this photo of her with Huey Lewis in one my favorite silly feel-good movies will sway you?